The Case Against the Supreme Court: Erwin Chemerinsky says justices side with powerful and privileged. The Supreme Court has almost always sided with the wealthy, the privileged, and the powerful, a new book argues. 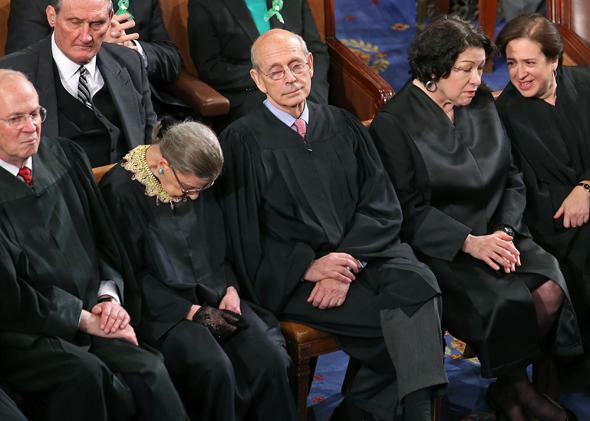 The Supreme Court: asleep on the job, in any era. Erwin Chemerinsky is dean of the University of California–Irvine School of Law and a respected litigator with decades of experience who has argued seminal cases at the U.S. Supreme Court. This month he has come out with The Case Against the Supreme Court. The upshot of the book? That the court itself—not the Roberts court but the Supreme Court as an institution—is a massive disappointment. As he bluntly puts it: “We should realize that this is an emperor that truly has no clothes. For too long, we have treated the court is if they are the high priests of the law, or at least as if they are the smartest and best lawyers in society.” The book painstakingly details the ways in which the Supreme Court has, in his view, almost always “failed, throughout American history, at its most important tasks, at its most important moments.” I asked Chemerinsky, who has taught generations of constitutional law students to respect and revere the high court, about what prompted him to write this book. One of the things you say toward the end of the book is that you don’t want it to be “criticized as a liberal’s whining that the court’s decisions have not been liberal enough.” But in a sense, the thesis of the book is that the court’s decisions haven’t been liberal enough. How do you get out of the stark left/right ideological framing that we are locked into when we talk about the work of the court? I thought about that a lot in writing the book. I intentionally begin the book with Buck v. Bell, a case that no one, liberal or conservative, would defend today. That was the 1927 ruling, authored by no less a justice than Oliver Wendell Holmes, upholding a Virginia involuntary sterilization law for a young girl Holmes described in his opinion as an “imbecile.” The first chapter is about the Supreme Court and race, especially focusing on its historic failures. No one today, liberal or conservative, would defend Dred Scott v. Sandford or Plessy v. Ferguson, the first broadly holding that slaves were property, not U.S. citizens, the second enshrining the doctrine of “separate but equal.” The second chapter is about the Supreme Court in times of crisis. I don’t believe anyone today would defend the Supreme Court’s decisions in Schenk v. U.S. or Debs v. U.S. or Korematsu v. U.S. or Dennis v. U.S. The third chapter starts with the child labor cases and the court striking down the first federal law to protect children from being exploited in the workplace. Again, no one would defend that decision today. Thus, before ever getting to the contemporary cases, I think that there is a strong case against the Supreme Court that liberals and conservatives would agree to. I understand that the discussion of the Roberts court cases will be perceived as more of a liberal critique. But I hope I have put the criticism in a larger context that cannot be dismissed as ideological. Your argument for the failure of the court rests largely in the criticism that the most central role of the Supreme Court is to “enforce the Constitution against the will of the majority.” I imagine that a lot of your critics would disagree with that assessment. I imagine others would contend the Roberts court does protect minorities, say, when it protects the rights of billionaires to contribute to campaigns, or of religious Christians who don’t want to fund contraception. What makes you so certain that acting as a counter-majoritarian check is the defining role of the court? I think that there are two important questions here. First, why believe that a pre-eminent role of the court is to protect minorities? To me, it goes to the question of: Why have a Constitution? Why should a democracy be governed by a document that is difficult to change? It is not to protect the majority; they generally can protect themselves through the democratic process. It is minorities who cannot protect themselves through majoritarian democracy. I believe that the Constitution exists especially (though not exclusively) to protect the rights of minorities of all types. Second, who is a minority? That is a difficult question. The key, based on my definition above, is those who are unlikely to be able to protect themselves in the majoritarian process. Examples include racial minorities, criminal defendants, the homeless, prisoners. Billionaires obviously are very able to protect themselves in the political process. Talk about your views on the Warren court, which, as you note, can hardly be faulted for being too conservative. The Warren court did much that is to be applauded: ending Jim Crow laws and the doctrine of separate but equal, applying the Bill of Rights to the states, expanding the rights of criminal defendants, protecting voting rights, and safeguarding privacy as a constitutional right. But I also think in key areas the Warren court did not do nearly enough. American public schools remain separate and unequal, and the promise of Brown v. Board of Education is largely unfulfilled. The Warren court could have done much more in providing timetables and outlining mechanisms for desegregation. Gideon v. Wainwright is a deservedly much-applauded decision in holding that those who face possible prison sentences in state court have the right to counsel under the Sixth Amendment. But the reality is that many criminal defendants, including those facing possible death sentences, have grossly inadequate representation. The Warren court created a mandate, but without funding or an enforcement mechanism. It’s important to emphasize that your book is not an indictment of the Roberts court (although you do have a chapter titled “Is the Roberts Court Really So Bad?”) and instead an argument that the Supreme Court, almost unerringly throughout its history, sides with the wealthy, the privileged, and the powerful. Can you explain why the court as an institution seems to align itself with those interests? Is it just too conservative an institution to act in the radical ways you seek? Are its members just too aligned with those interests by definition? Yes, my book seeks to appraise the court throughout history and not just the Roberts court, though, of course, it discusses the Roberts court. You accurately state my thesis: Throughout history the court has overwhelmingly favored corporate power over employees, consumers, and the public, and has favored government power over individuals’ rights. I do not have a good or a sophisticated answer to your question of why. I think justices have overwhelmingly come from positions of privilege. Far more justices have been like John Marshall Harlan and John Roberts, having spent their careers representing corporations, than from being public defenders or public interest lawyers. I think, too, that the Court’s role has never been clearly enough defined in terms of enforcing the Constitution, protecting minorities, resisting the passions of the majority in times of crisis. You call out both Chief Justice John Roberts and Justice Sonia Sotomayor, saying they should be ashamed of themselves for peddling the “just calling balls and strikes” metaphor in their confirmation hearings to describe what justices do. What is it about that image—which I imagine strikes most Americans as both reassuring and accurate—that so affronts you? It is a grossly inaccurate description of what Supreme Court justices do. Supreme Court justices do not simply call balls and strikes. They determine the rules and the strike zone. Justices have tremendous discretion in the cases coming before them, and the descriptions of Roberts and Sotomayor portray it otherwise. Every Supreme Court decision makes the law. When the court decides whether states can prohibit marriage equality, that will make the law whichever way the court describes it. John Roberts and Sonia Sotomayor would have been confirmed almost no matter what they did at their confirmation hearings. Each gave the American public a very misleading sense of what the court does. You don’t discuss Roe v. Wade in the book, except in passing, or say much about the line of reproductive freedom cases that followed. Is that a place where in your view the courts got it right, or—as you say of some of the race cases—failed to go far enough? I believe that Roe v. Wade was correctly decided. The court previously had ruled (in Griswold v. Connecticut and Eisenstadt v. Baird) that reproductive privacy is protected under the “liberty” of the due process clause. Laws prohibiting abortion unquestionably interfere with that privacy by forcing women to carry a pregnancy to term against their will. The question is whether a state has a compelling interest in protecting fetal life. But given the inability to decide when human life begins, why should it be the state rather than the woman to decide prior to the time at which the fetus can survive outside the womb? I very much disagree with those, such as Justice Ginsburg, who have suggested that Roe went too far too fast. If not for Roe, how many women would have died or been seriously hurt by unsafe, illegal abortions? How many women would have given birth to unwanted children? Why didn’t I discuss Roe in this book? I defend the decision in my last book, The Conservative Assault on the Constitution, and really didn’t have anything to add to what I said there. The book ends with a list of proposals that might nudge the Supreme Court toward becoming the court it needs to be. Many of these deal with transparency, others with shorter terms, and some with the judicial selection process. I wonder if those fixes will lead the court to be “brave” in the ways you would prefer, or just less fearful. I don’t know. There is no magic bullet, no single proposal to make the court better and more courageous. Ultimately, my hope is that if people realize the court’s past failures, we will be better able to avoid similar ones in the future. But I do believe that there are ways to make the court better, ranging from more clearly defining their role to merit selection, changing the confirmation process, term limits, changing the way the court communicates (such as allowing cameras in the court), applying ethical rules to justices, and changing recusal procedures. My hope is that cumulatively these proposals might make a real difference. Why don’t your objections to the Supreme Court lead you to reject the notion of judicial review, which would seem to solve so many of your underlying concerns? I have spent my legal career representing individuals who cannot succeed in the political process: criminal defendants, including individuals facing death sentences; prisoners; the homeless; a Guantánamo detainee. I know for my clients it is the courts or nothing. I have lost most of the time, but the courts were my clients’ only chance. Achieving the goals of the Constitution that I identify—protecting minorities and enforcing the Constitution in times of crisis—can realistically happen only through the courts. I think John Marshall got it right in Marbury v. Madison: The limits of the Constitution have meaning only if they are enforced. The judiciary is often essential to enforce the Constitution. I was struck by your characterization of the high court simply growing “bored” of the Guantánamo cases. Do you think that’s a function of terms that are too lengthy, or a court that gets too caught up in current events? It is now more than six years since the court last decided a case about Guantánamo. One hundred and forty-nine individuals remain there, some of whom have been there for 12 years. There have been many cases where the D.C. Circuit seemed to openly defy the Supreme Court about granting relief to Guantánamo detainees. Yet, in every one of these cases, the court denied review. I am deeply troubled by this and cannot explain it. Perhaps, as you say, it is terms that are too long and justices get desensitized. (I wonder if that is why the court has refused to take cases involving challenges to the methods of execution and botched executions). I worry that it reflects the lessening of public attention to Guantánamo. Liberals criticized the Bush administration about Guantánamo but have not criticized the Obama administration in the same way. It is wrong, but it makes it easier for the court to do nothing. Finally, you and I have publicly disagreed about the wisdom of urging Ruth Bader Ginsburg to step down while Obama can still replace her, but I wonder if you have any thoughts on the rather dramatic, almost iconic role she has come to play for young feminists in America—people who see something in this 81-year-old jurist that makes them want to wear Notorious R.B.G. T-shirts? Ginsburg seems to have stepped into a new, almost rock-star, level of fame this summer, which she has fed with a seemingly endless round of interviews, some of which are quite controversial. I have no idea what to make of it. Your disagreement gave me great pause about my position. I simply worried that if the Republicans win the Senate in November—a real possibility—President Obama’s ability to pick her successor will be greatly limited. If a Republican wins in 2016, it seems unlikely that she would still be on the court in 2021 at age 88 or 2025 at age 92. The only way she could have assured that someone with her values and her views took her seat was to resign at the end of last term. President Obama could have had almost anyone he wanted confirmed this past summer. But you make a terrific point: Justice Ginsburg deservedly plays a dramatic, iconic role for young feminists and all of us. I admire her tremendously. She, of course, could play that role, and speak even more in the media, if she were not on the court. Ultimately, she made a gamble that the election process will allow her to be replaced by someone with similar values. We’ll only know when she does step down and see who replaces her. But to be clear, I share your admiration for her. I think it is interesting that she spoke publicly much more this summer. Some of her comments were about the male justices, particularly the five conservatives, not understanding the importance of matters like contraception to women’s lives. I recall her very powerful comment in the media five years ago when the court had before it a case about strip-searching a junior high school girl and her male comments not understanding what it was like to be a teenage girl. A lot of Justice Ginsburg’s comments were about her not resigning. I think we all have heard that message forcefully expressed. I only hope for all the things she believes in that she made the right choice.